Mister Meese working on a child-sized lectern. I first earned my certification to teach 3- to 6-year-olds the Catechesis of the Good Shepherd material in March 2009. Ever since then I've been DYING to create the teeny tiny materials we see at church so that I can pass on the faith and help children to fall in love with God. But every time I've tried to buy or make the many specific items needed I've run into roadblocks and delays. Until now. Enter the greatest handyman, who also happens to be a member of the Antiochian Orthodox church. 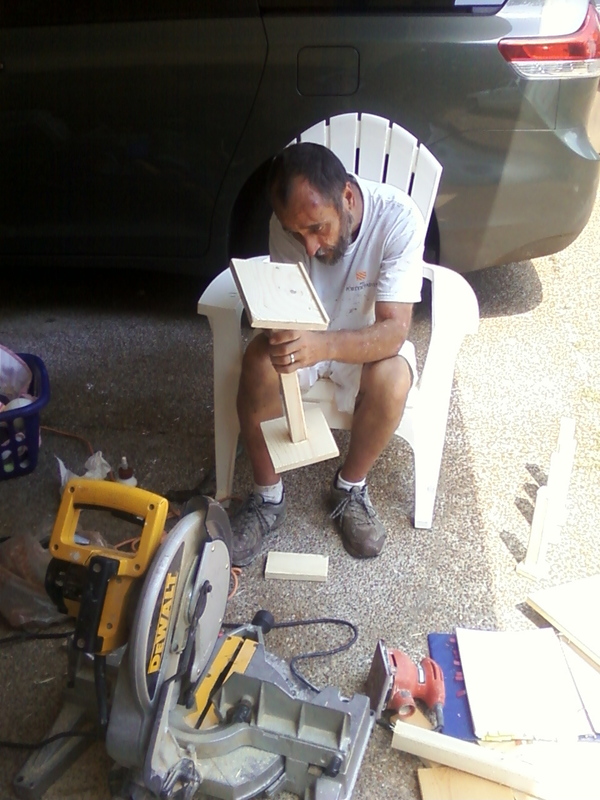 This week he's been helping make a teeny tiny lectern, altar, prayer table, chasuble holders--you name it! I hope to show lots of photos soon of a new, improved little classroom. Oh, and someday I hope to catch up with my Level 2 Catechesis of the Good Shepherd training, for 6- through 9-year-olds! If you've never heard of this beautiful method of passing on the faith, check out Catechesis of the Good Shepherd USA. Thanks for the advice! I will try that. You are lucky if you will be entering Level 2 training after already making all of your Level 1 items--I get the two levels all jumbled up in my brain, so that it's hard for me to remember which presentation is for which level! LOL! :) I hope that you can continue training. It has been a wonderful learning experience for me and has helped my faith grow. God bless you!